When we approached updating the front end, we set out with a lot of goals: we wanted the UI to be easier to understand and navigate, while also leaving room to grow in the future. Additionally, we wanted the front end to feel integrated with the rest of the game by giving it more life and character. 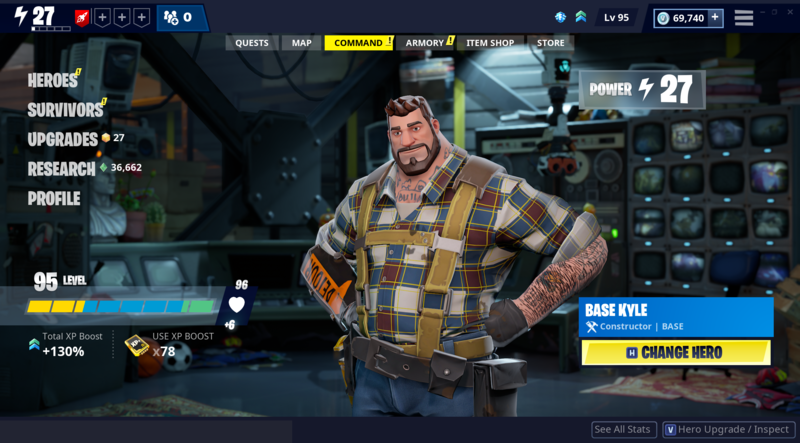 In the revamp, many of the menu options now represent locations within your “Homebase” and are staffed by characters you meet as part of the campaign. The new Command tab acts as an overview of your account progress and prominently features your current hero. The screen acts as a hub and provides a variety of options that become available as you progress through the campaign, offering quick access to change your hero, view your stats, and manage all the heroes and survivors that make you more powerful. 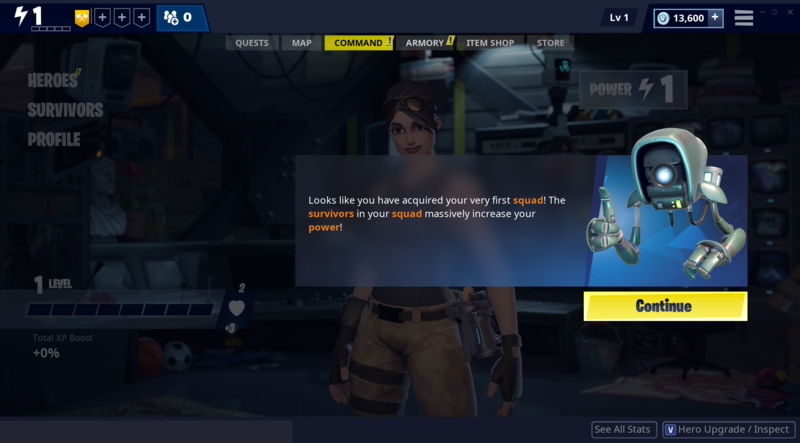 “Homebase power” is now simply called “Power” and a variety of rewards are given when you level-up, including F.O.R.T. stats, as well as schematics and resources. XP boost information is also visible on this screen and provides a shortcut to activating boosts. We’re excited to introduce a new character to help whip your heroes into fighting shape: The Major! Once you meet him in the campaign, he’ll be located in the Training Room. The Major unlocks your ability to level-up and manage your heroes, as well as provides access to defenders, expeditions, and your hero loadout. We’ll have more details on the new hero loadout when that feature is closer to release, but for now it handles your primary hero as well as tactical and support slots. We’ve added a back button in the top left to allow for easier navigation on the menus. Players who use a controller can still use the primary controller back button. 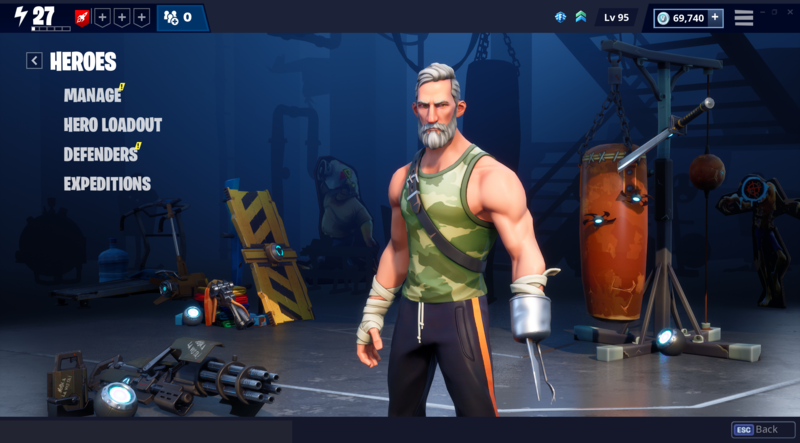 The survivors screen is where you’ll encounter another new addition to the cast: the Director, found later in Stonewood. 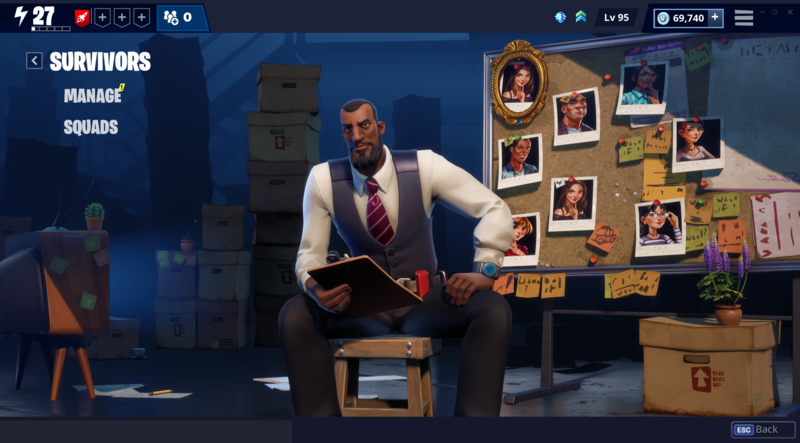 He’ll help you manage all of your squads and survivors. We’re also introducing a new feature called Auto-Fill. Auto-fill works by making sure your survivors with the highest power are always slotted in a squad. Although it is on by default, you can always take full control at any time. There’s also a new quick tips screen to better explain the matching rules of squad slotting. Lastly, we’ve added a feature to make navigation between item types faster than before. Use the left and right arrows to quickly change between heroes, schematics, survivors, defenders, and resources! The Upgrades room is staffed by Kevin, your robotic helper for gaining access to gadgets and other tools. Upgrade points, earned by leveling-up during missions, can be spent to acquire and improve gadgets, as well as upgrade utility options, like backpack size and pickaxe strength. You can preview the details of each upgrade level in order to make a more informed decision for where to invest your points. 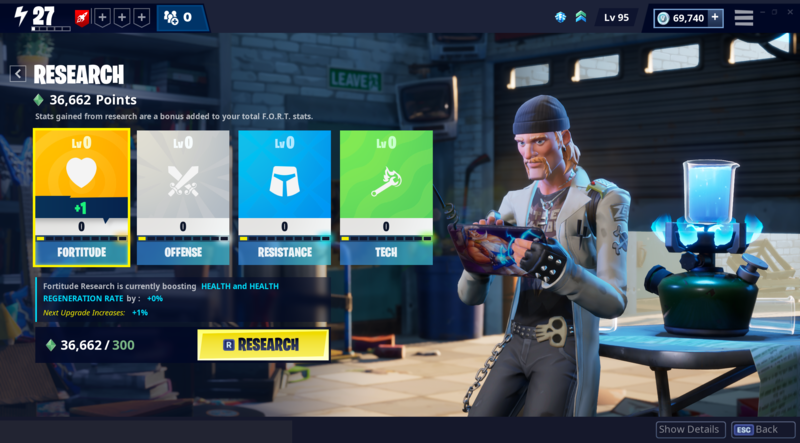 Our favorite van-flying scientist, Lars, has taken up residence in the Research Lab, where he’ll allow you to spend research points on the F.O.R.T stats of your choice. We’re also introducing bonus meters that provide you with extra stats when filled. The point generation rate and storage capacities of the Research Lab are now occasionally upgraded when you level-up. 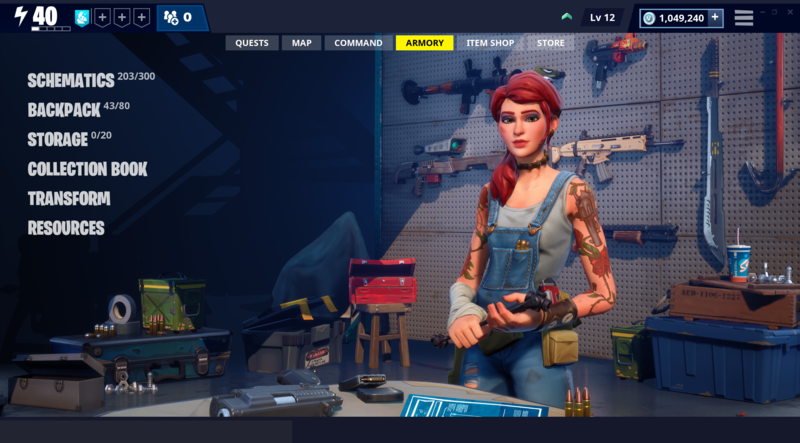 The Armory remains the place to be to access and manage all of your schematics, items, and resources, as well as the Collection Book and transform features. In the update, however, the Armory is now appropriately staffed by another new character: Clip, your weaponsmith. You’ll unlock her as you progress in the campaign. Like any weaponsmith worth her salt, Clip keeps your most powerful weapon schematics prominently on display. The Quests tab is now the first tab in the UI and shows the campaign and event quest maps that you can scroll through, inspecting rewards as you go. We’ve made a few other changes as well. First, the Play Now button was moved to the bottom of the screen, to be more consistent with where other game launching buttons are located. Second, the quest log is now accessed from a large button directly below the Play Now button. This placement allows it to be instantly accessible from the campaign and event quest maps, allowing you to pin quests without having to navigate away from the quest map. In the future, we’d like to make it easier to navigate the quest map. We’ve also made some changes to improve the new player experience. Previously we used a lot of quests with UI-based objectives to help explain new features, but they were often hard to notice and not as effective as they could be. The quest-driven UI tutorials have been replaced with contextual, quick explanations of key features as they are unlocked. Prior to this revamp, new users could be taken back by the amount of tabs, menu options, etc. available right from the beginning of the game. With the introduction of the new Homebase characters, features are now more consistently revealed as the player progresses through the campaign, being briefly explained when additional clarity is necessary. HOW DOES THIS AFFECT MY ACCOUNT? WHAT ABOUT THE SKILL TREE? DEFENDER SQUADS? This revamp replaces both the old skill and research trees and spreads their functionality into new places. The trees could be slow to navigate, a bit difficult to understand, and had some options that weren’t always very compelling. These changes move the more impactful gameplay choices directly into the Upgrades room. Features that are necessary to progress through the game, such as unlocking survivor slots, evolution, etc. are now rewards as part of campaign progress and interaction with the new Homebase characters. Additionally, we’ve removed some old restrictions, such as requiring “leadership” nodes in order to play certain character classes, as a way to smooth out the flow of the beginning of the game. With the skill tree removed, we’ve filled in the account level-up rewards with F.O.R.T. stats, upgrade points, and various resources, such as xp. In a future release (not 6.30), we’ll also be adding a feature that allows players at max level to infinitely earn an additional reward each time they would have leveled up again. We’ll be tracking xp gains for max-level players in the meanwhile from 6.30 on in order to retroactively grant those rewards in the future. When these changes go live, your account will be converted in such a way that it should be just as powerful or even more so than it currently is in terms of stats and progress. You will automatically and retroactively be granted any rewards you would have been granted for leveling up and any features you previously unlocked should remain unlocked, even if you’re not up to where they now become available within the campaign. You’ll have an equivalent amount of research already stored up in Lars’ Research Lab based on your existing research progress as well. We know there’s a lot of new stuff to take in, so we’re also granting existing players a way to reset the new Upgrade room and Research Lab a couple times each while you figure things out. One last thing to mention is that the requirement to pre-select defenders has been removed. 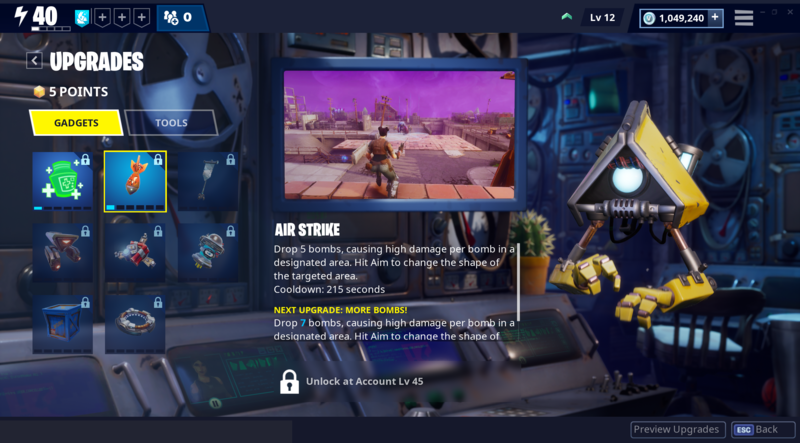 While the same rules governing how many mission and storm shield defenders you can have at once have been carried over, you can now summon any defender by just using a defender post.